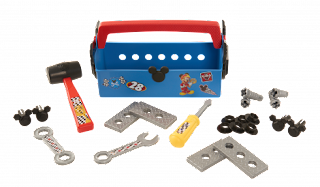 Join Mickey Mouse’s pit crew with the Roadster Racers Tool Box from Disney Junior’s new hit show, Mickey and the Roadster Racers! This awesome racer themed tool box is designed to look just like the one Mickey uses in the show! The set comes with 23 tools including a mallet, flat head screwdriver, 2 wrenches, play metal plates, screws, nuts, and nails. The tool box even comes with a working peg board so little racers can put their tools into action! The perfect gift set for every Roadster fan! Tool box inspired by Disney Junior’s Mickey and the Roadster Racers. Set comes with 23 fun tools including: a mallet, flat head screwdriver, 2 wrenches, play metal plates, screws, nuts, nails, and more. Pink bag as seen in Disney Junior’s Minnie’s Happy Helpers. Includes a light and sounds cell phone that reveals the next Happy Helpers mission. Charms pop off Minnie’s bag and can be snapped into the bracelet for a customizable accessory. Comes with 9 accessories including: a light and sounds cell phone, pair of heart-shaped sunglasses, bracelet with 2 pop in charms, pretend passport and passport holder, pretend boarding pass, and sticker sheet. Summer Fun with Mickey and the Roadster Racers & Minnie’s Happy Helpers Bag Set from Just Play! My kids absolutely love Mickey and Minnie and to be honest I don't know a kid that doesn't. 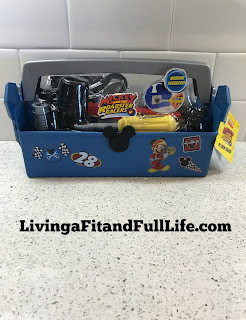 Mickey and the Roadster Racers Pit Crew Toolbox is straight from Disney Junior’s new hit show, Mickey and the Roadster Racers and looks exactly like the one that Mickey uses in the show. My son loves that it's a racer themed tool box and is filled with everything he needs to stay busy for hours. 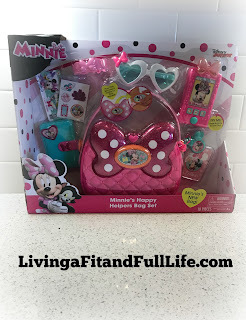 Minnie’s Happy Helpers Bag Set is totally adorable and is filled with everything your little one needs to complete their next Happy Helpers mission. 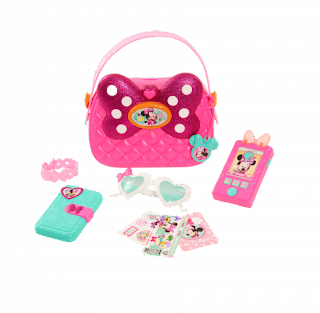 This set comes with a pink bag as seen in Disney Junior’s Minnie’s Happy Helpers that will absolutely delight your little one. My 4 year old has been carrying this bag around for days and literally won't leave the house without it. Which, just happens to be great for this mom of 4 because she has everything she needs inside to keep her entertained. Minnie’s Happy Helpers Bag Set and Mickey and the Roadster Racers Pit Crew Toolbox are absolutely perfect for little ones and are the perfect way to keep kids entertained this summer! Available for purchase at ToysRus, Target and Kmart!